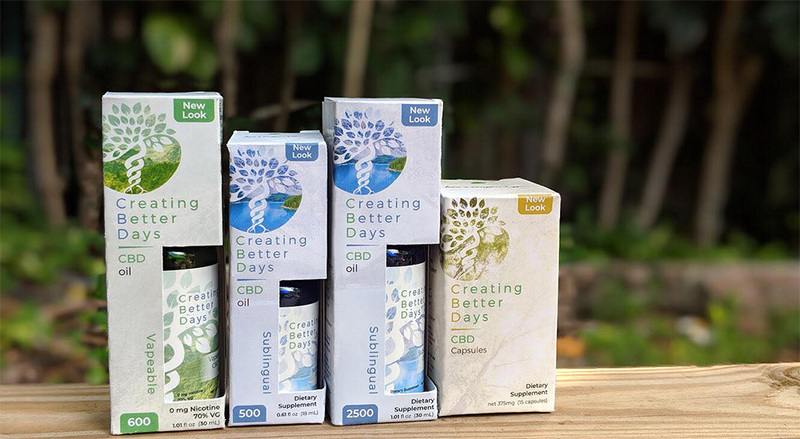 Creating Better Days is a different style of CBD company, please enlighten us how the vision came about? 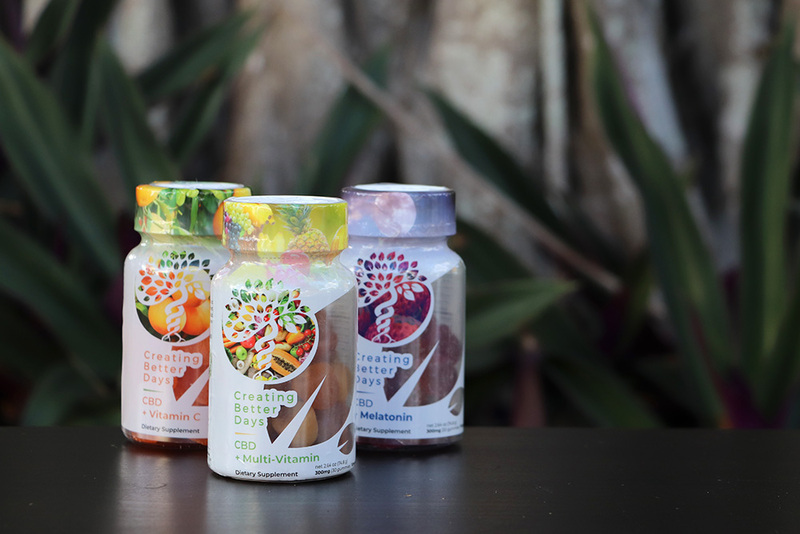 Creating Better Days CBD aims to provide alternatives in the health industry while continually educating the community to ensure the best holistic experience possible. Driven by the life-changing impact of Cannabidiol (CBD), a natural, non-intoxicating compound found in hemp, the company’s image pays homage to the natural and primal origin of the compound as nature’s way of creating better days. The packaging works to offer the minimalistic impression of a clean, modern company while retaining the organic image of CBD’s origin. A window shaped to a blooming, intertwined tree invites the viewer to see a simple glimpse of nature. Dedicated to creating the safest, purest holistic products, Creating Better Days CBD aims to leave an optimistic, trustworthy, lasting impression for better days. A lot of companies are still offering a similar style of CBD products; however, your company is placing focus on Nano CBD Products, why Nano CBD? There are two main problems with typical CBD products. First, they take a long time to absorb through the gastrointestinal system which delays action. And secondly the body can only absorb a fraction of the actual dose. Our focus on Nano CBD was to develop a product that had a higher bioavailability resulting in less waste for our consumers, ultimately, allowing them to have smaller doses for the same relief. Please explain the difference between Nano CBD and standard CBD products. Standard CBD particles measure about 2000 nanometers and human cells can only absorb particles of 60-80 nanometers. Basically, a cell can’t use a particle that’s larger than itself, so you get a lot of wasted CBD. Most CBD extracts and concentrates are sticky hydrophobic substances which are hard to handle and incompatible with water, and since they are not water tolerable they result in low bioavailability in the body. Lower bioavailability basically means you must consume way more of the product to get the desired benefit. The new CBD molecules are 100 times smaller, about as small as 16 nanometers which means that there is literally no waste. Dosing is actually lower because your body is absorbing the majority of it and the CBD crosses the blood/brain barrier more efficiently. Regarding the delivery of Nano CBD it is much more concentrated than standard CBD, please explain the differences in dosage needed? Reviews of existing CBD products in the market express that only about 35% of a dose is absorbed into the endocannabinoid system. Whereas nano-amplified CBD products maximize the benefits of CBD through smaller particle sizes that cause an 80-90% absorption which means quicker digestion and onset of action. In relation to the production of Nano CBD what are the main differences in the process? Nano amplified CBD uses all natural co2 extracted CBD isolate, which then undergoes a process called nano-emulsification which encapsulates the CBD molecules into lipid cells to essentially create a smaller molecule. This new smaller and more water tolerable CBD leads to greater bioavailability and an overall much more efficient use. The delivery of Nano CBD, it is pretty much instant. How does this help athletes? Correct, Nano-amplified CBD has a higher bioavailability and absorption rate. This in turn helps athletes who have sore muscles find relief quicker as well as helping with a faster recovery period. In short, it helps them to feel better and get them back in the game. How do you control the quality of your CBD products? All of our products are made from 100% all-natural industrial-grade hemp, our CBD-infused products are made in ISO7 Cleanrooms for sterile production to ensure each package and bottle has the proper balance in all aspects. Our raw product is sent out for third party testing before manufacturing and finished products are also third party batch tested and retrievable by QR code on all of the final packaging for our consumers. People seem to be getting much educated about the CDB sphere nowadays, has this spike in education helped with sales of Nano CBD Products? Education and the legal landscape has helped propel the knowledge and acceptance of alternative medicine such as CBD. The power of the consumer to do their own research on the internet through scientific articles, testimonials, and forums have been crucial to the awareness of CBD. Every moment is historically ground breaking for us from a legal and regulatory standpoint for us, from the 2014 Farm Bill that allowed for provisions of hemp to the modification of the 2018 Farm Bill which specifically clarifies the legality cannabidiol extracts, and of course the approval of Epidolex, a pharmaceutical CBD isolate. Any expansion plans for Creating Better Days to move into foreign markets and what are the near future plans? Yes, we are in the process of exploring foreign markets this year. However, at this time we have to keep it under wraps. We would love to speak more on this in the second half of this year so that we are able to elaborate. To us, CBD does create better days! So it was a perfect name for our company and a clever way for us to use the acronym to help people understand CBD and remember our company. It was a win win!